The central mountain range runs east west over the whole length of the island with several peaks over two thousand metres and many active volcanoes. 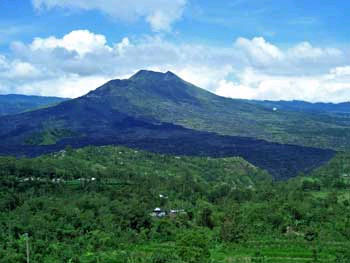 Standing on the slopes of the northern volcano mountain Kintamani, you can sometimes see even Denpasar in the south. Bali’s volcanic nature has contributed to its exceptional fertility and the high mountains provide the rainfall which irrigates the island’s complex and beautiful rice terraces. The popular trip to the north coast mountain range leads along mount Kintamani and Gunung Agung from which you have magnificent views. The saying goes that the Balinese look away from the sea and towards the mountains, as it should be the abode of the gods. 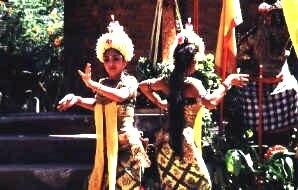 But the Balinese don’t live on them, they live on the gentle, fertile land rising up the mountains. 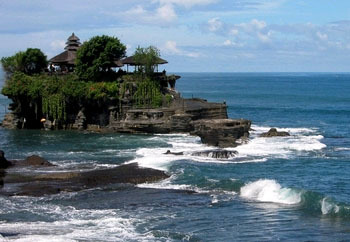 The spectacularly placed Tanah Lot temple is situated on a little rocky islet, connected to the shore at low tide but cut off as the tide rolls in. 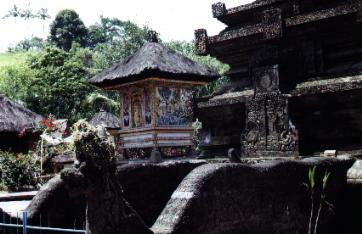 The southern part of Bali, is the touristic centre of the island. The overwhelming mass of visitors is concentrated here. Sanur and Kuta, once fishing villages, are nowadays Bali’s major international resorts. For the Balinese, tourism is a peripheral thing, away from the southern beaches you can still find Bali’s soul up towards the mountains. There you will find dense tropical forests, rice paddies tripping down hillsides and holy mountains rising up into the sky.